Sulfur is a great anti-inflammatory ingredient to look out for. It comes in the form of masks, cleansers and lotions. Here’s most helpful information on using sulfur products for treating acne. Many of you may not be aware that sulfur can solve skin problems. Moreover, you may be wondering just how does sulfur work for acne or how to use sulfur for acne? In ancient times sulfur was used to treat skin infections. The ancient Egyptians used a salve made with sulfur to treat both acne and eczema. The Traditional Chinese Medicine was using sulfur in skin care before the reign of the Yellow Emperor, some 2,200 years ago. Sulfur is still used for treating acne. Since the 1950’s, sulfur has been available in the form of over the counter product – a 5% sulfur foam that is applied directly to broken skin. Moreover, the foam is also available containing 10% sodium sulfacetamide – an OTC emollient to treat acne without clogging pores, at the same time moisturizing to the skin as well. This sulfur product exterminates acne bacteria fast while it softens the skin. But, the downside to sulfur products is that they smell bad. And when fragrance is added to sulfur products to make them smell good, the result is reddening and irritation of both healthy skin and acne-affected skin. Tip: Sulfur can kill acne bacteria, but it is definitely not for everyone. There is one skin type, however, that responds especially well to sulfur foams. I will discuss how sulfur reacts on different skin types in the later paragraphs. Acne occurs when glands under the skin produce too much of oil. When this oil gets combined with bacteria and dead skin cells, pores can get blocked. This causes formation of acne, pimples, whiteheads or blackheads. Sulfur has keratolytic and antibacterial properties, which help eliminate the bacteria and dead skin cells combo that has clogged the pores. So, sulfur basically attacks the problem that causes acne at its roots. Is Sulfur Suitable For Acne? (i) Sulfur gives best results when you have mild to moderate acne, typified by pustules and small pimples. However, some studies have found that its anti-inflammatory properties may also help in case of even severe or cystic/hormonal acne. (ii) It is suitable for both inflammatory and comedonal acne types. Thus, if you have pustules, blackheads, or a combination of the two, sulfur may benefit you to improve your skin. (iii) Sulfur can also be helpful while treating patients who may have acne as well as rosacea and/or seborrheic dermatitis, because these conditions can also respond to this medication. 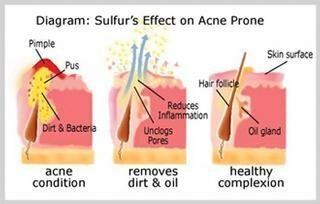 How To Use Sulfur To Treat Acne? Sulfur tends to dry out the skin. Dry skin can incite secretion of extra oil, aggravating the acne problem further. Thus, it is recommended that you use this treatment cautiously. A way out is to use sulfur as a spot treatment. Simply apply small amounts of the sulfur product to problem areas only so as to do away with most of the risk associated with using this type of acne treatment. You can find a number of soap-based acne products in drug stores and online. Sulfur soap seems to be one of the more popular treatments. Its deep cleansing action takes out bacteria and dead skin cells buried deep within your skin. Next the antibacterial and keratolytic properties get rid of dead skin cells and bacteria from the outer layer of the skin, eliminating the blockage and allowing your skin to breathe. (i) Sulfur foams work best for treating acne on Asian skin. Asian skin produces just one kind of melanin pigment. On the other hand other skin types produce two or three. On other skin types, sulfur generally causes the skin look red. But on Asian skin, sulfur brings out natural skin tones. (ii) As a matter of fact, the sulfur foam and facials that contain sulfur as an ingredient can exterminate acne bacteria on any kind of skin. But they are known to work best at improving the appearance of Asian skin on the face. (iii) However, sulfur foams may help in treating back acne (also known as bacne) on all skin types. For treating back acne, it is generally not required to use topical tretinoin. A combination of sulfur-sulfur acetamide foam in the morning and benzoyl peroxide treatment in the evening peels dead skin around pores in the back, and exterminates acne bacteria. Consequently, the skin on the back can heal itself. Sulfur foam acts as a moisturizer as well. So, it will work equally well on both pimples and blackheads on the back. This also helps when it is used with topical tretinoin, which when used alone can dry out the skin. (i) A combination of foaming sulfur in the morning and topical tretinoin at night may work effectively for people who have Asian skin. (ii) For those who have fair skin, foaming sulfur treatment may make pimples “come to a head” so that they drain quickly. (iii) For people having dark, oily skin, foaming sulfur treatment may probably shrink pimples and cause blackheads to fall out of their own. According to The American Academy of Dermatology, sulfur masks remain a tried-and-true option for treating mild and moderate acne. According to Drugs.com, sulfur masks assist eliminate dirt and extra oil from the skin, which can help in healing acne. Moreover, in many people sulfur helps skin to peel. Consequently, it powers out blockages from pores. Sulfur masks can cause skin irritation, especially if you use the mask on already-tender skin. Teens and adults have used sulfur masks for decades to treat mild to moderate acne, and medical research backs their use. Dr. W. Elstein, a researcher, tested a sulfur mask in acne treatment against a placebo mask containing no sulfur. This study was reported in 1981 in the medical journal “Cutis”. The study reported that the sulfur mask worked noticeably better than the placebo mask to control acne, and the study subjects liked its effects on their skin. (i) A sulfur therapeutic mask containing up to 10 percent sulfur along with purified clays to clear pores along with blemishes. (ii) A sulfur cooling mask containing up to 10 percent sulfur along with eucalyptus oil to treat acne while hydrating your skin. (iii) And if you want to use less irritating sulfur mask, you can use an acne free sulfur mask containing about 3-4 percent sulfur plus vitamin C, zinc and copper. There are some other sulfur mask variations available. Choose the one according to your specific needs. (i) According to Drugs.com, never use a sulfur mask product to treat acne on sunburned or chapped skin, or you’ll risk severe skin irritation from it. (ii) Make sure not to combine sulfur mask treatment with another over-the-counter acne product, like benzoyl peroxide, unless your physician advises you to do so. The combination of two potentially irritating acne products can damage your skin. (i) Some people are allergic to it. (ii) Some of the more common side effects are swelling, itching, and redness of the skin. Always test a dot of sulfur product on the skin of your forearm, leaving it there for several hours, before putting it on your face. Avoid using the product on your face if it causes irritation on your arm. (iii) Stop using the product, if it makes your skin tingle, sting, or burn, or if redness is noticeably worse. (iv) Never get any kind of sulfur product on jewelry. It can blacken both silver and gold. (v) Never use sulfur products containing fragrances to cover up the sulfur smell. The fragrance can cause irritation that cancels out the benefits of the sulfur. (vi) Sulfur is very strong and its excessive use can rob your skin of the hydrating moisture it needs to fight dryness. This may leads to severe dry skin. This in turn can results in to peeling and cracking of the skin’s surface.